Do you remember how good it felt to unroll a whole roll of toilet paper when you were younger? We all did this as a child but now you can relive the silly joy in the palm of your hand! 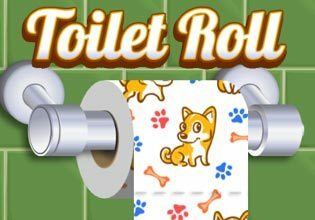 In this simple yet highly addictive game you have to empty as many rolls as possible within one minute. Roll and drag as fast as possible, but make sure not to tear off the paper, this will cost you a lot of valuable time. The points you get can be invested in upgraded papers and the results can be shared with your friends:Play Toilet Roll now for free and let loose your inner child!